Hankettes began in 1996 as a small home business in the founders’ attic, making simple handkerchiefs out of organic cotton. Today, they make and sell some of the greatest in reusable “green” products out there. And there’s now much more than just handkerchiefs! What makes Hankettes so great? There isn’t a single aspect of “green” production that they’ve missed. All their products are hand-sewn. The cloth is all organically-grown cotton. 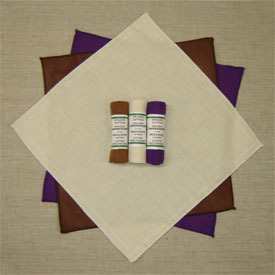 Coloured fabrics are either colour-grown or hand-dyed with fiber reactive dyes. Production is all local, along the Sunshine Coast in British Columbia, Canada. It’s still at heart a small family business. Their practices are transparent. Their website links to “green” information, resources, and even competitors. And the family itself is a homesteading, homeschooling, compost toileting role model, that truly walks the walk. They are proof positive that sustainable and ethical business practices can be successful. Our business truly reflects our lives and enhances the lives of our environmentally conscious customers around the world who purchase our natural based products. Hankettes products offer something for everybody and every occasion. For the kitchen diva, you’ll find tea infusion bags, coffee filters, napkins, salad bags, dishcloths, and herbal teas. For the fashion-conscious, silk-screened bandannas and triangle scarves will adorn your head while herbal lipsticks, facial scrubs and acne care kits will keep your face looking its best. For bedtime, there is a complete range of bedding and pillows. For the fun you have after you go to bed, there are “intimate solutions” – Happy Guy & Happy Gal Freshening Cloths, anyone? And for the resulting children of these happy parents, there are stuffed toys, cloth diapers (even diaper-free babies usually need a few), receiving blankets, and wipes. Don’t forget the nursing pads, and the cloth menstrual pads for when your cycle comes back. And of course, there are the original hankies, which come in different sizes, colours, and even in lace! There are even products for your pets, as well as soaps, essential oils, and perfumes. We’ve used many Hankettes products in our house and will continue to do so. We’ve bought many different cloth napkins and hankies from different retailers, some organic and some not, and the Hankettes are consistently the first ones we reach for. If you think all of this sounds fantastic, there’s still one bit of information that is perhaps even better. They offer free shipping on orders over $50 throughout Canada and the US. So if you’ve been looking to replace your wasteful disposable products with earth-friendly, reusable ones, sustainably and ethically produced, your search is at an end. Hankettes has it all! Very very nice stuff. Unfortunately, it is far far too expensive! 46 Green Moms and Eco Dads on Twitter: Follow Eco Child's Play to Win! Will the EU Ban Food Colorings to Reduce ADHD and how will the FDA React?